This special Summer–Fall 2013 double issue of Communio takes up various aspects of the question of religious liberty. 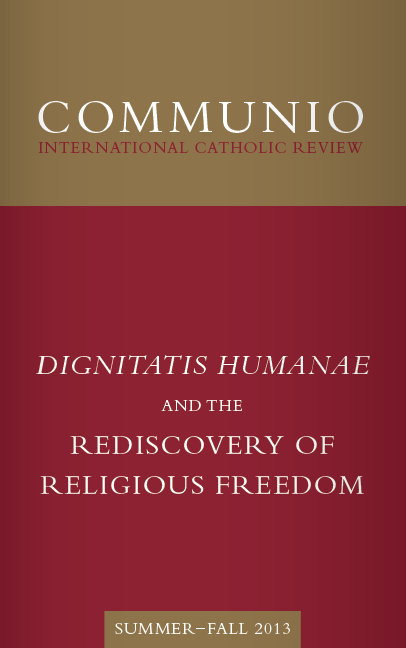 In February 2013, the Pontifical John Paul II Institute for Studies on Marriage and Family co-sponsored with Communio a conference on the theme “Dignitatis humanae and the Rediscovery of Religious Freedom.” The present issue of Communio contains the papers from this conference, as significantly edited in many cases for publication. The papers appear largely in the order in which the conference was planned, though it should be noted that illness, the resignation of Pope Benedict XVI, and preparation for the conclave that elected Pope Francis required the absence of some of the speakers. Thus, the actual order in which the papers were presented at the conference differs from what appears here. David L. Schindler, in “Freedom, Truth, and Human Dignity: An Interpretation of Dignitatis humanae on the Right to Religious Liberty,” introduces the issue, focusing on the question at the center of the conciliar bishops’ concern: the relation between freedom and truth, and the nature and foundation of the right to religious freedom. Schindler makes two arguments: first, and more generally: “In fact, Dignitatis humanae retrieved what is most true about modernity (its emphasis on subjectivity and the dignity of the human subject), in terms of what lies at the very heart of the ancient-medieval tradition (its notion of the spiritual nature of human subjectivity and the transcendental nature of truth). The prevalent juridical interpretation of the Declaration, in contrast, with its primarily ‘negative’ idea of rights as immunities, embraces a reductive sense of modern subjectivity even as it implies a defective grasp of ancient-medieval notions of the free-intelligent human act and of truth.” Second, and more specifically, the negative idea of the right [to religious freedom] is essential for the Declaration, but the Declaration understands this negative idea to take its proper meaning only from inside the human being’s originally given positive relation to God and to others. Angelo Cardinal Scola, in “The Nature and Scope of Religious Freedom in our Contemporary Culture” points to the Edict of Milan of 313 as having epochal significance for our understanding of religious freedom. The Cardinal then goes on to trace this historical significance, and explores how the conciliar Declaration Dignitatis humanae both takes up the Edict of Milan and develops it. In “Religious Liberty and the Church’s Voice in Transforming Our Culture: An American Perspective,” Donald Cardinal Wuerl reflects on the contemporary challenges to religious liberty, most especially in light of Popes John Paul II and Benedict XVI’s call for a New Evangelization. In his “America and Religious Freedom,” Carl A. Anderson proposes that in light of the principles given in Dignitatis humanae, we must begin to discuss “the despotism of tolerance” in America. Despite “the form of American exceptionalism” we have experienced “in regard to the question of religious liberty,” or perhaps rather precisely because of it, the questions of Dignitatis humanae and religious liberty may seem not to loom so large for America. But they exist, Anderson asserts, and more pressingly now than ever before in American history. George Weigel suggests, in “Dignitatis humanae: Origins and Unexpected Consequences,” that “the challenges of postmodern culture and its alliances with state power were unforeseen” in late 1965, when Dignitatis humanae was promulgated. He says, however, that this is all the more reason to be grateful for the conciliar Declaration. The Church drew on the document in order to understand its position vis-à-vis the evil of twentieth century Communism, and so too, Weigel asserts, must the Church do so in relation to a twenty-first century liberal modern conception of the state. Nicholas J. Healy Jr., in “Religious Freedom and Truth: The Contribution of Pope Benedict XVI,” writes that “for Pope Benedict, the two basic tasks of the Council—handing on the faith of the Church and determining anew the relationship between the Church and modernity—should not be juxtaposed or placed merely side by side.” The author explains Pope Benedict XVI’s contribution to the interpretation of Dignitatis humanae, arguing that religious freedom in our time involves a comprehensive theological anthropology. David S. Crawford’s article poses the question, “Is Religious Liberty Possible in a Liberal Culture?” The problem, Crawford writes, is that understanding religious freedom raises the question of admissible forms of public discourse. If we reject truth as a political question, as the American philosopher John Rawls requires us to do, then we must accept that the political can never properly be about the comprehensive truth or good. In “The Right, the Good, and the Place of Freedom of Religion in Human Rights,” Paolo G. Carozza traces the historical genesis of human rights in the Western legal tradition. He suggests that the 1948 Universal Declaration of Human Rights “is minimalistic in its embodiment of a substantive vision of the human person and society,” but that over time this minimalism has acquired greater specification and content. It has done this, however, without much reference to the good, and Carozza recommends Dignitatis humanae as a strong corrective.